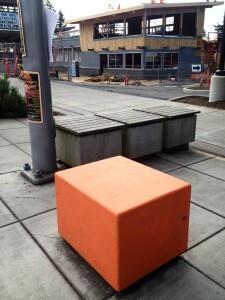 One of the benches that has been painted orange near along Winslow Way. 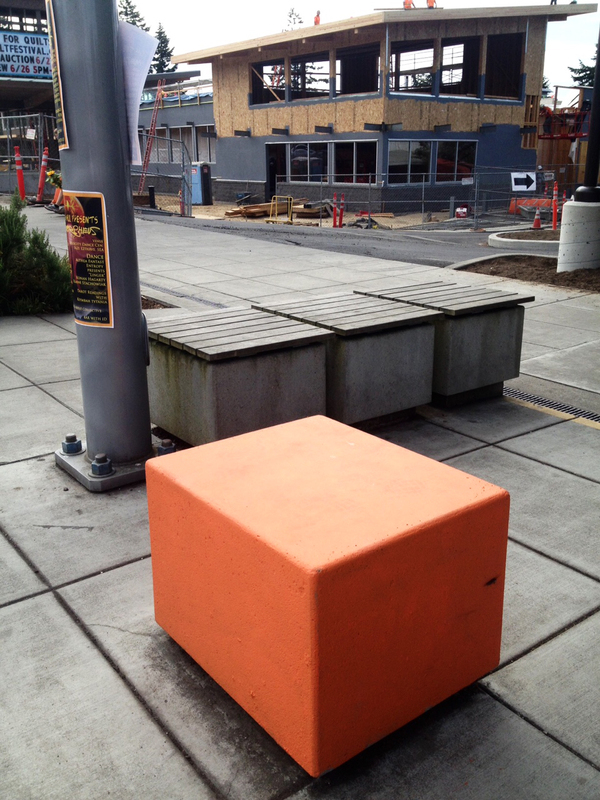 At least four small cement cube benches along Winslow Way were “mysteriously” painted orange recently without consent from city officials, said City Manager Doug Schulze. The city is trying to find out who did it. 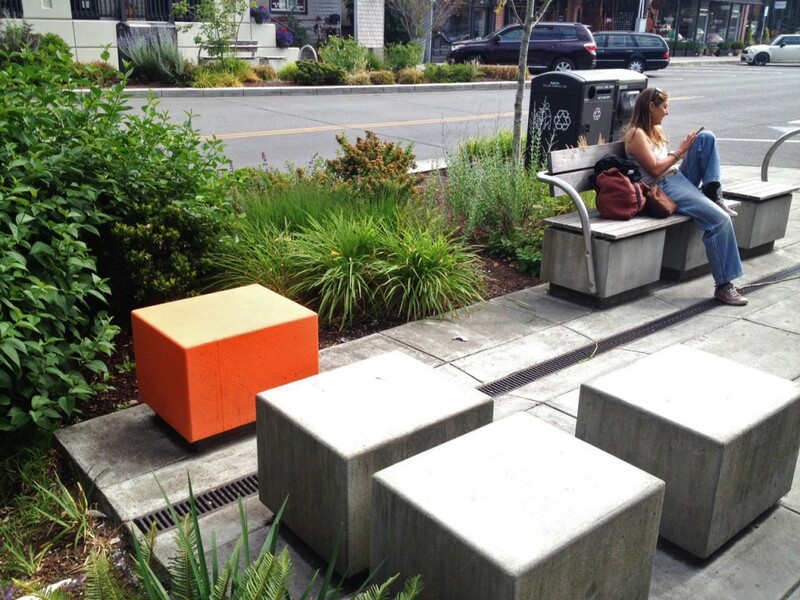 The city could leave the benches orange or paint over them with a cement gray color. “If you hear any rumors about who might have done this, we’d like to chat with them so this doesn’t continue,” Schulze said. Bainbridge Island could be asking for proposals for the Suzuki property, instead of hiring consultants. Councilman Val Tollefson said a council subcommittee he is on decided hiring a consultant — who would breakdown how much money could be made on the property based on the buyer and development purpose — would leave the city right where is was Tuesday, needing to ask for proposals. Interested parties would have 45 days to respond to the published request, which is expected to have a list of priorities for the Suzuki property laid out by the city. Affordable housing or mixed housing with affordable and market-value houses. Open space, community gardens and connecting trails. Integration with adjacent neighborhoods and island character. Tollefson also suggested the public should have input on the proposals the city receives. Several residents have voiced concern about traffic issues and housing density. Others have asked the city to leave the property as is. The school district is not interesting in buying the property, Mayor Anne Blair said. The council has previously talked about allowing affordable housing to be built on the land. 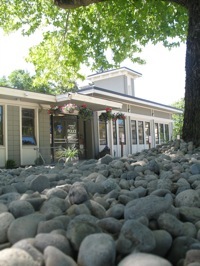 “Frankly, the city owns a valuable piece of property and needs some money,” Tollefson said. The undeveloped Suzuki land is assessed at about $500,000, according to county documents, which is the price the city paid for the property in 2000. The City Council decided to sell the 14-acre Suzuki property in 2008, and use the money to pay for a new police station. Last week, the council selected a site for a new police station and court facility. It is estimated to cost about $15 million, including buying land. City Council is considering paying the Bainbridge Community Foundation to oversee and help allocate about $323,000 for nonprofits. An exact cost or where the money would come from was not decided during Tuesday’s council meeting, although the foundation’s proposal outlined $21,050 in fees. Community nonprofits voiced concern about how paying the foundations could take away money for local services. The Health, Housing and Human Services Council previously helped guide the city in funding local nonprofits. During the economic downturn, the council all but dissolved the Health, Housing and Human Services Council. The city cut away $103,000 worth of administrative support in 2010, ending funding for the organization’s executive director and administrative assistant. The Health, Housing and Human Services Council was created by the city in the early 1990s, and tasked with distributing city money to about a dozen human service groups — from the food bank to the teen center. It also undertook regular community needs assessments and surveys. 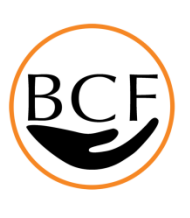 The city has still provided funding to nonprofits since 2010, although it has not reviewed whether the amount these organizations receive should change based on needs or if the organizations are still based on Bainbridge Island. A new Human Services Funding Advisory Committee also would be formed to make recommendations on goals and funding allocations. 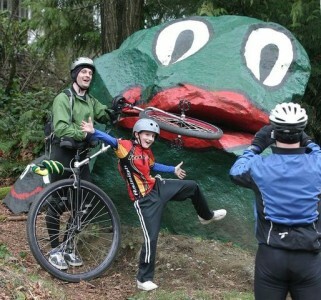 The city of Bainbridge Island is looking to start refunding the Public Art Program. In November 2010, the council voted to suspend program funding. Now, the council is moving forward with plans to transfer an equivalent of two-percent of all eligible municipal capital construction projects to the art program. Water, sewer and stormwater management facilities would not be eligible projects. City officials could decide to include an additional transfer during discussions on individual projects. City Council is expected to approve the ordinance during one of its Tuesday meetings in the near future. City Council is considering an ordinance to allow temporary tent cities on property owned by religious organizations. The city’s insurer, Washington Cities Insurance Authority, suggested city officials have regulations on tent cities since a church sued the city of Woodinville for not providing a permit for a temporary homeless camp in 2006. The church said the city was violating its first amendment right to free exercise of religion, and won the lawsuit. Bainbridge Island’s proposed ordinance would allow camps for up to 92 days with a permit and require campers be over the age of 18. No drugs, alcohol or open flames would be allowed. The number of campers would be limited to 100. A “ sight-obscuring fence” could be required around the camp unless there is “sufficient vegetation, topographic variation, or other site conditions,” according to the proposed ordinance. A public hearing for the ordinance will be scheduled. The Bainbridge Island Police Station on Winslow Way. Locations for a new police station are back in front of City Council for discussion with a new site option. The three places being considered are along Madison Avenue. Sakai property on Madison Avenue near New Brooklyn Road, north of the land being bought by the island’s park district. Property on New Brooklyn Road by the fire station headquarters on Madison Avenue. Land north of the current City Hall. None of the property options are owned by the city. City Council also will discuss transferring Pritchard Park to the park district and future plans with the Suzuki property during Tuesday’s meeting. It’s the last day of filing for the fall elections. While one City Council member has withdrawn, another has filed. While the island’s City Council and school board have a handful of seats on this year’s election ballot, there is only one race where multiple candidate have filed. Susan Bergen and Kol Medina have filed for the North Ward to replace Anne Blair, who is not running for reelection. Pegeen Mulhern has filed for the at-large seat to replace Steve Bonkowski, who also announced he is not running for reelection. Michael Scott, appointed to the Central Ward earlier this year, and Sarah Blossom, who represents the South Ward, are running for their current seats. Mev Hoberg and Tim Kinkead have filed for reelection and do not have any opponents as of Wednesday morning. 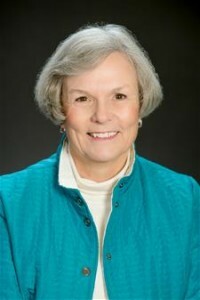 Patty Fielding will not be running for reelection to the school board, and Lynn Smith has filed for Fiedling’s position. Candidates have until the end of the business day Friday to file. Who is running for reelection? Bainbridge Island City Council members Anne Blair and Steve Bonkowski have announced they will not be running for reelection this fall. Each have served one four-year term. Council members Sarah Blossom and Michael Scott said they anticipate filing for reelection. The deadline to file is May 15. 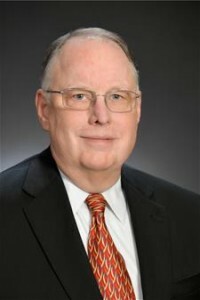 Scott was appointed to the council this year after Councilman David Ward resigned as part of a public records lawsuit against the city. A Kitsap County Superior Court judge ruled last year that Bainbridge city officials didn’t perform an “adequate” search for public records documents on Bonkowski’s and Ward’s personal computers. Bonkowski said his decision not to run had nothing to do with the lawsuit, and he was not seeking reelection because he had done everything he set out to do on the council. Blair said she would not be running so she could spend more time with her family. The three other seats — held by Wayne Roth, Roger Townsend and Val Tollefson — are not up for reelection until 2017. City Council members voted 5-2 to buy 100 percent green energy for the city. Council members Sarah Blossom and Steve Bonkowski voted against it. Bonkowski said he would vote against it because of the low percent of residents who participate, which he correlated to green energy support. About 13 percent of islanders participate in Puget Sound Energy’s Green Power Program. The program relies more on wind, bio-gas and solar-energy sources instead of coal. The city had been buying about about 13 percent of its electricity from green energy to match the resident participation, costing about $3,000 a year. The city spends a total of $330,000 a year on electricity, and going to all green power would cost the city an additional $15,000 a year. Going all the way with green energy? City Council will discuss buying 100 percent green energy for the city’s electricity at its next business meeting in two weeks. Puget Sound Energy’s Green Power Program relies more on wind, bio-gas and solar-energy sources instead of coal. About 13 percent of the city’s electricity is from green energy, costing about $3,000 a year. The city spends a total of $330,000 a year on electricity, and going to all green power would cost the city an additional $15,000 a year. The council decided to buy 13 percent green power from PSE last year, matching the percent of residents that use green power. Two other Washington cities buy 100 percent green energy, said Heather Mulligan, PSE market manager. Those cities are Lacey and Bellingham.